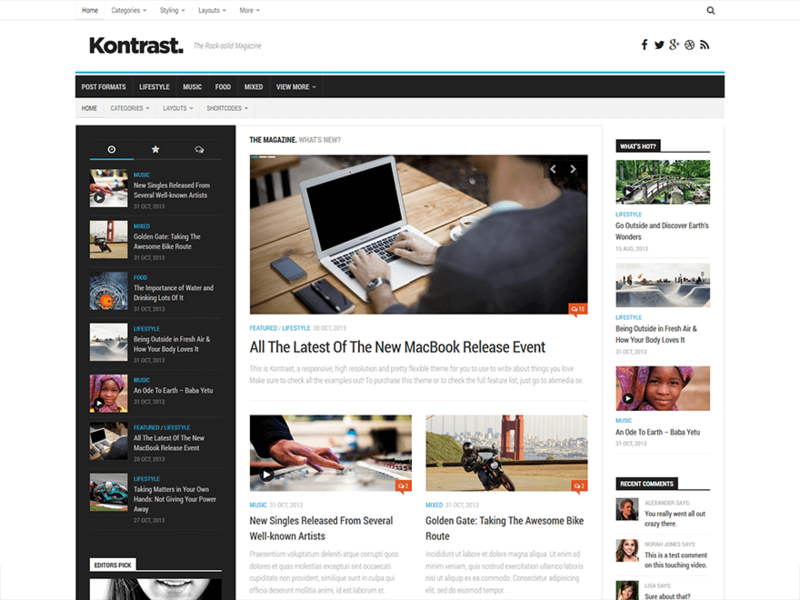 Kontrast is a responsive 100% high-resolution theme for blogs and magazines. Unique toggle sidebars give a great browsing and reading experience on both tablet and mobile. The feature list is long: Unlimited accent colors, unlimited widget areas, 0-2 sidebars to the left or right that can be uniquely specified for each page or post, 300px / 220px fixed width sidebars, 0-4 footer widget columns, almost zero layout images, related posts and post nav, featured story or slider, 10 post formats, good SEO, 2 flexible custom widgets, localisation support, social links, logo upload and many more useful admin panel features.